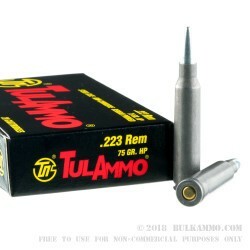 Heavier than your standard .223 Remington ammo - these Tula 75-grain loads are preferred by many shooters because they feel a heavier bullet provides more stability when firing a fast moving caliber like .223. Russian-made Tula is incredily well-known in the shooting community here in the United States for two good reasons: 1.) It's incredibly cheap to shoot. 2.) It's reliable for range training. Pair them together and you're getting a lot of trigger time for the moeny! 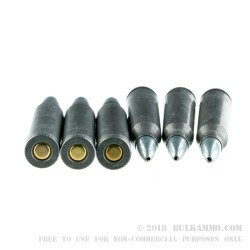 This Tula 223 ammunition is loaded with a hollow point projectile designed to expand when it comesin contact with soft targets. When it's time to pick a cheap round for your next hog hunting trip, that makes this an option you won't want to ignore. 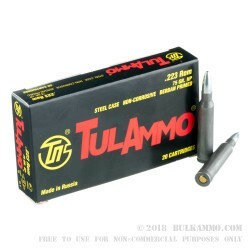 Give Tula a shot - pick up this ammo today and you'll receive a single box of 20 rounds ready to fire and we think you'll be back for the full case of Tula 223 for next time! 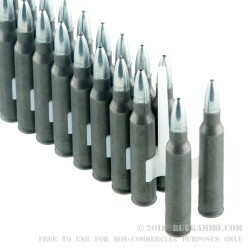 Worst ammo that I ever shot.